Volkswagen has shown its zero-emission SUV concept car, the ID Roomzz, ahead of the Shanghai Show. 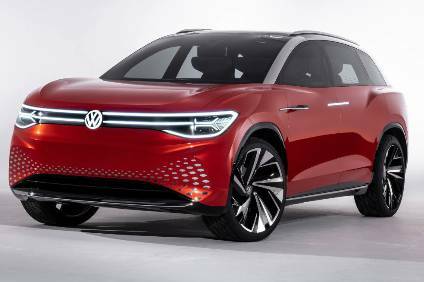 VW is also planning to launch a large electric SUV with three rows of seats in China from 2021. VW describes the autonomous drive equipped concept car as a lounge on wheels. However, it likely provides some pointers to the design of the large electric SUV planned for 2021. It was presented at the "Brand SUV Night" in the run-up to Auto Shanghai. The car is a zero-emission SUV of the five-metre class which is tailored to both family and business requirements, VW says. The series version is to be initially launched on the Chinese market in 2021. "This SUV is a monolith, appearing to be seamlessly machined from one solid block. The battery-powered ID Roomzz moves effortlessly – silently and without emissions," says Klaus Bischoff, chief designer at the Volkswagen brand. The concept is designed around 'level 4' autonomy and features 'IQ.DRIVE' systems – on request it can glide fully automatically through the traffic in 'ID. Pilot mode'. The vehicle occupants are provided with information via interactive light zones. Various seating configurations can be adapted not only to passengers' personal wishes, but also to the respective driving mode. VW also says the materials used in the interior are also unusual. The seat covers, for example, are made of AppleSkin – a new product that consists of a 'renewable raw material' (VW leaves it at that). Specially processed wooden veneers are also used in the "ID. Light" areas of the door panels. The CleanAir system uses an active filter system to ensure that the air in the vehicle interior remains clean even if the ambient air isn't (that would be a plus in China). With its 82-kWh battery, the ID Roomzz boasts a range of up to 450 km (WLTP) or 475 km (NEDC, China), respectively before the battery has to be recharged. In about half an hour, the concept car can be recharged to 80% of its capacity via a fast charging system with 150 kW (DC). Two electric motors can continuously drive both axles with a system output of 225 KW / 306 PS (electric 4MOTION). The ID Roomzz can accelerate to 100 km/h in 6.6 seconds and reach top speeds of up to 180 km/h (electronically regulated).